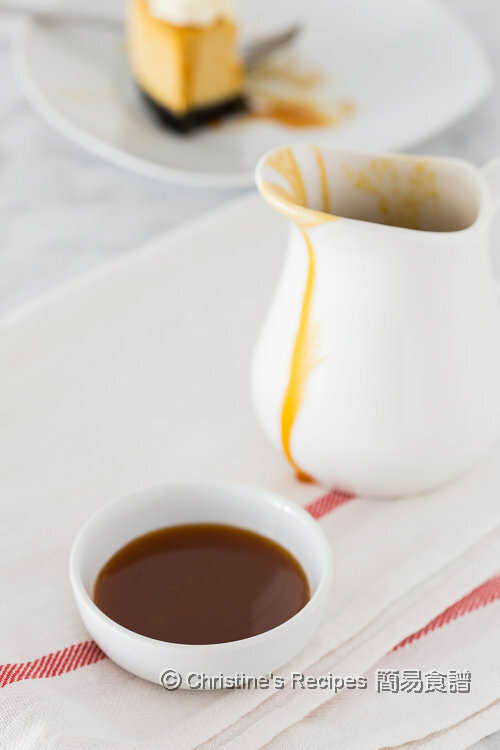 Caramel is an amazing, classic sauce for many kinds of dessert. Once the white sugar is cooked into amber or dark brown colour, it gives a wonderful caramel smell. Previously, I made a simple caramel for creme caramel (a French custard dessert), with only sugar and water. This time, a small amount of butter and cream were added to increase its creaminess. I drizzled some over my cake. I didn’t feel it’s too heavy, but wanted to have more. If you’ve ever tried caramel sauce before, you’d know how wonder it tastes. Use a heavy based pot as it’ll conduct heat evenly and better. Be cautious that the sugar dissolved will be very hot. Put the sugar into the pot. Gently shake the pot a few times in order to help the sugar spread evenly on the bottom of the pot. Heat the sugar over medium heat until it dissolves and turns into amber colour, about 10 to 12 minutes. Add the butter. Use a whisk to help combine thoroughly. Remove the pot from heat. Wait for about 3 to 5 seconds. Carefully stir in the cream. The sugar is still at a very high temperature. Be cautious. Let it cool down at room temperature. Drizzle as much as you like over your favourite desserts, ice cream and cakes. It can be kept for 1 week or so in fridge. After chilling, the sauce will become thicker. Reheat it in a microwave or submerse the caramel sauce pot into hot water to loosen when needed. Be cautious that the sugar will be very hot while cooking. When it turns brown, don’t pour in the cream instantly. Wait a few seconds to avoid from splitting some liquid sugar out. Beware when the cream is added, the mixture will foam up. So use a pot large enough. You can remove the pot from heat once the sugar is completely melted. The darker colour the liquid sugar turns into, the bitterer it will taste. 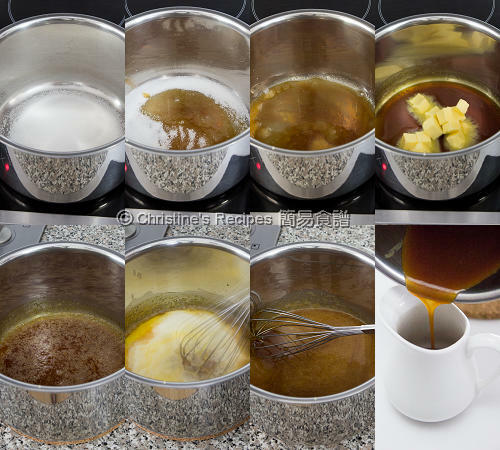 Thank you for sharing your Caramel Sauce recipe... can we do further than this like, a pipeable Caramel Frosting? Can you share your pipeable Caramel recipe? :) Thank you! 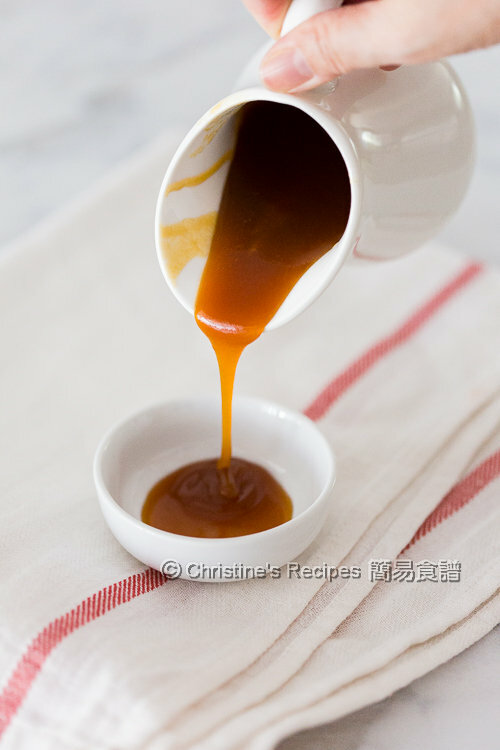 This caramel sauce can be pipeable. If it's chilled, the sauce is thicker. You might like to experiment with adding more butter.